My children's sleep is a big deal for me. Truth be told, prior to moving onto the boat, questions regarding their sleep, namely: where would they sleep, was the one thing I...well...lost sleep over. You see, we have a two cabin (aka "bedroom") boat and with five people including a toddler and infant twins, that means we had to get a little creative with our arrangements. 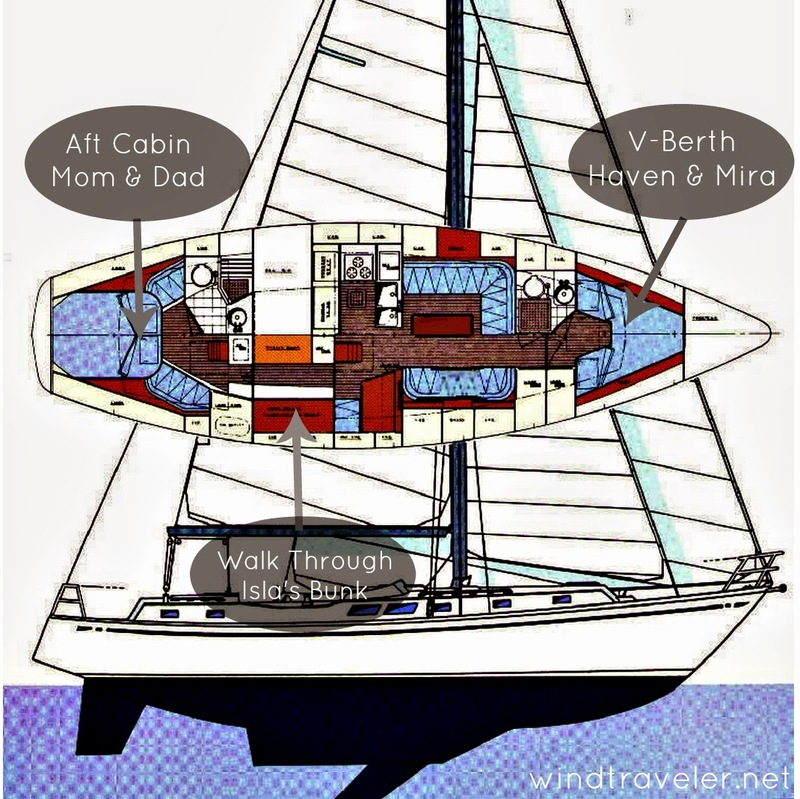 The aft cabin was taken by Scott and I, the twins had been assigned to the v-berth...but what about Isla? Where would she sleep? The obvious option was for her to share our cabin with us, but that was not ideal for a lot of fairly obvious reasons. The other option was to have her sleep in the main salon, but that was also not ideal as it is our main living space and would confine us to cockpit as soon as she went to bed. There had to be another option. I kept returning to the pictures of our boat and tried to envision other options when suddenly it hit me: the walk through! Because our boat is a center cockpit/aft cabin design, we have a small hallway of sorts with a workbench in it. It's where Scott keeps all his tools and is the unofficial "work area" of our boat when Scott get's in project mode (which translates to some point every day, love my handy man!) I looked again at the pictures and my mind's eye got to work...yes...it could happen...a lee cloth here, a small mattress there, a fan there...yes, YES! Isla could, in fact, have her own little space. When we got down to the boat I tweaked the design. I decided a lee cloth would be too cumbersome and a lee board would better fit the bill, as it would be more rigid and easier to deploy and break down. Prior to flying down we ordered a child's sized Therm-A-Rest online which we thought would fit perfectly. It did. We then got a piece of wood cut to the length of the berth (this would be the lee board) and Scott installed brackets for it on either side so it could slide in and out easily. He also installed some mast steps along the leading edge of the bunk so she could climb up and down on her own. Because the control panel with all our switches also lives in this space, I sewed a cover (reinforced with phifertex in the middle to add stiffness) and installed some snaps around the edges (love this Pres-N-Snap tool ) so that she didn't kick on or off any switches in the night. We cleared out our belongings from the shelves so Isla could a place for her special things and, voila! 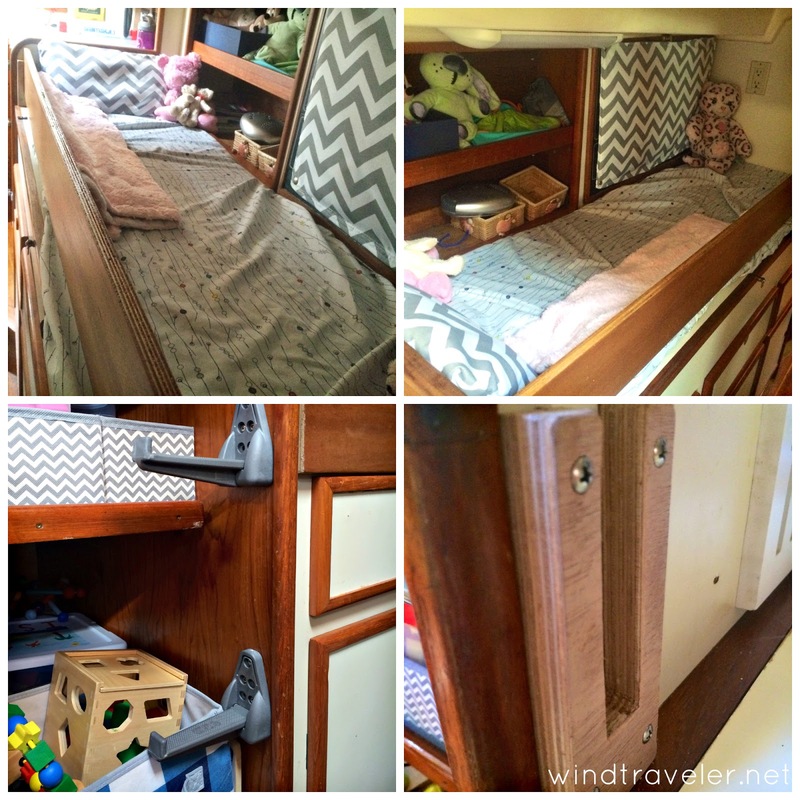 A perfect child's bunk was born! In practice, this design has worked awesome. Minus the initial protest about sleeping in a completely new place, Isla now loves her bunk and prefers it to sleeping anywhere else. She climbs in and out like a little monkey and sleeps soundly all night most nights (sometimes the twins do wake her), but we do have to be very mindful if we are in the salon or galley while she is sleeping, as loud noises will wake her. Nevertheless, she has a special place to call her own on the boat which is fantastic in my book. Designing the twin bunk took many, many hours in my head. We knew immediately that they would be sleeping in the v-berth, but sadly - the bed that worked so well for Isla would not work for two babies, and there was not enough room up there for two of those beds. We needed to come up with something different. What made matters even more complicated is the fact that we need access to our anchor locker pretty regularly, so whatever bunk we made needed to be easy to set up and break down should we need to get in there quickly (we almost always need to "knock down" our chain pile if we let out more than 130 feet of rode). 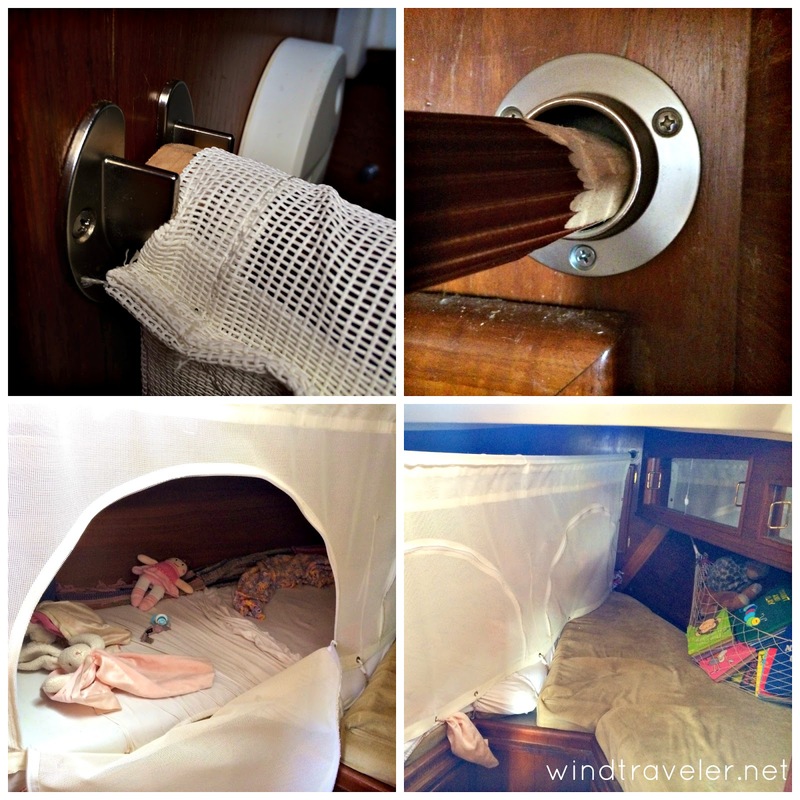 I struggled with whether or not to just corral the entire v-berth into a giant play pen with a big lee cloth across the front, but then I figured that would not be an efficient use of space, not to mention there are lights and a fan up there that the little fingers would surely find and destroy. Finally, I decided on what I think was the best solution and that was to have the entire port side of the berth partitioned off for them. This would allow for plenty of room for both babies to sleep, and allow the entire starboard side for diaper changes, a nursing area, or another sleep zone if for some reason I needed to be in there during a rough period (sickness, teething..etc). I got to work designing, all the while running my ideas by Scott. Together we perfected the design by adding two half-moon zipper openings and a small divider in the middle to keep the babies separate. The local sailmaker at the Nanny Cay Marina brought our idea to life. 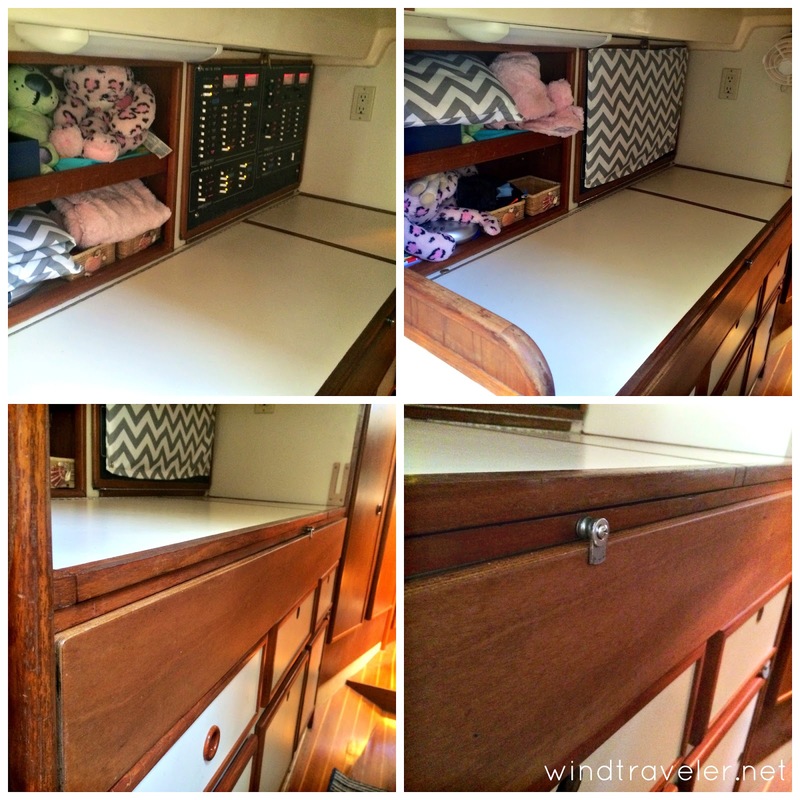 To install we used a wooden shower curtain rod (very strong, but light) held in place by two metal curtain brackets, the entire lee cloth has grommets all around which then attach to the bulk heads and bottom of the bunk with strong bungee that Scott cut to size. This allows for a very strong, secure fit and also allows for the shower rod to be sort of spring loaded which means taking it down is a breeze. In practice, our design works great - minus the divider bit. Haven scaled that thing in an instant and it became clear that the girls would have to learn to sleep together. They have (phew). If I were to re-design it, I wouldn't make it so high (we went overkill on height to make sure no one could climb out) because it's hard to peek over the top, which is nice to be able to do (I love looking at sleeping babies!) I would also have only one half-moon zipper opening as opposed to two because now, without the divider, the second opening goes unused. Other than that, it's perfect. They love it and sleep great - which is all this sleep crazy mama can ask for! To ensure a good night's rest, we also have these battery operated sound machines for both areas to help dampen any noise (boats are notoriously noisy with their clanging halyards and squeaky floorboards!) They work great and while they do eat up batteries, we run our generator enough when we are making water to be able to use rechargables so that we're not contributing batteries to the landfills. 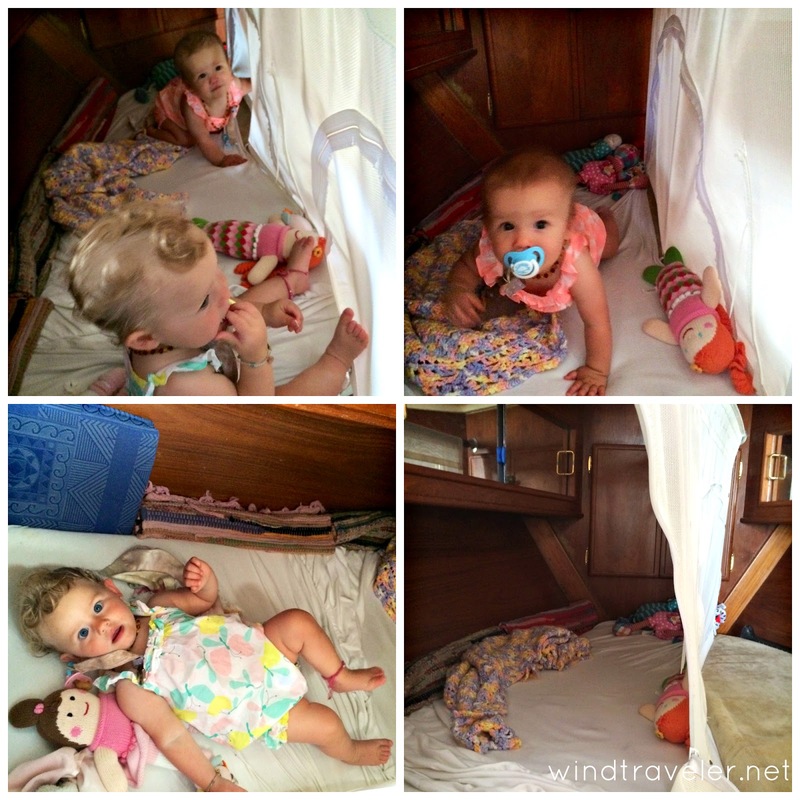 How have other boat mama's and papa's contained their little ones aboard? Share in the comments if you wish! Thanks for the details about the bunk renovation. It's making me rethink our own plans. Right now we are planning to convert the forward head on our Whitby 42' into a berth for our two year old. I worried about our workbench being to narrow but looking at your pictures gives me hope. Time to get back aboard with the tape measure. It's all about the creativity. Love you guys and everything you're doing!! A boat accessory ladder with unbreakable rungs. Transom and swim platform mountings. Drop it, it floats. With heavy duty dive master quality, our afte pontoon ladders. When our 5 year old was a baby, we lifted the v berth cushions on our Luders 33 and put a pack n play up there. When our 4 year old added to mix, we used lifeline netting to separate the vberth, and a crib cushion around the perimter of her half. The problem wasn't the kids on the Luders, it was the fact that we grew tired converting the dinette every night and having to suddenly wake up and reconvert the dinette for kids breakfast and play. So now on the Tartan 40, it's easy. We have our aft berth. The vberth has a 12 inch board down the middle and 1 kid on each side. I remember hanging a baby swing from our dodger frame early on with our 9 month old son while taking a 10 day cruise. But we're a few years away from going off for a year, and kids will be 7 and 9, so should be much easier. You are definitely troopers and we have been following along for years! this is very informative post and its inspired my. I like your blog so much. thanks for the share .by the way all of the baby's pic so cute. Looks like they are all your kiddos having great time. Thanks for sharing lovely experience with all. We also use sound machine when traveling with kids, it's really powerful to asleep in different environment.